Boca Grande Florida sounds like a ‘Grande’ idea if you are looking for a calm, relaxing getaway that doesn’t require any movement on your part other than to get out of your chair, the one with the bright umbrella, for a fresh drink or a snack. “Boca Grande” in Spanish means “Big Mouth” but they’re not name- calling. This quiet coastal fishing community is anything but pretentious. At the southern tip of the island lies the Boca Grand Pass, which was historically used for shipping because of its deep waters, but now it’s just used for fishing and casual boating. This is a bonus for those who want to fish the deep sea without having to take a boat out for miles. Boca Grande Florida is located on Gasparilla Island and a small toll is collected upon entrance but well worth the small price where the beach is lovely, unpretentious and the locals welcome tourists with open arms. You’ll feel so at home on this gorgeous, calm and peaceful beach that you won’t want to leave. Take a private boat or ferry out to Cayo Costa State Park for some of the best shelling in the world. Craving more nature? At Gasparilla Island State Park you can enjoy more beautiful beaches along with nature trails and bird watching. 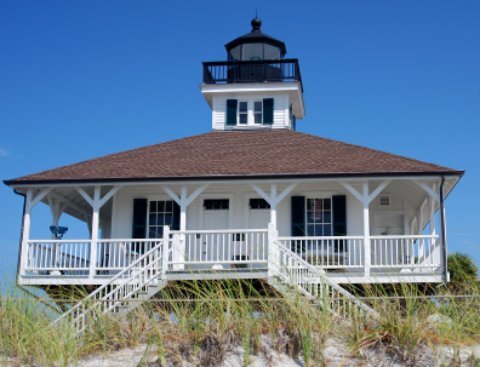 Don’t miss the Boca Grande Lighthouse Museum, a historical home to lighthouse keepers and their families that now houses a museum full of historical info and artifacts. If you’re visiting in July, you’ll get to see the World’s Richest Tarpon Tournament that’s held here every year. Kids of most ages: There is no beach that is more perfect for beach bumming with the kids and watching them run on the shores of the beach and try to hop over the waves in the water. Eating: Tempt and satisfy your taste buds at Temptation Restaurant, Bar & Package with some delicious seafood. It’s a bit pricey, so make sure you bring enough moolah along. It’s well worth the expense though! For a taste of the delicious local cuisine, check out the Eagle Grille.